The 2010 Texas Reading Club, Catch the Reading Express! provides opportunities for children of all ages to enjoy reading. It begins on June 7, 2010 at the Rio Grande City Public Library. This free program is co-sponsored by the Texas State Library and Archives Commission and includes weekly reading activities and events. Children from pre-school to entering 2nd Grades will meet from Monday through Thursday 9:30 a.m . to10:30 a.m. Children entering 3rd Grades to 5th Grades will meet from Monday through Thursday 11:00 a.m. – 12: 00 p.m., Children unable to attend at these times may still participate by maintaining a reading log available at the library. 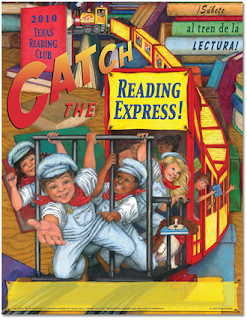 Information about the Texas Reading Club is available by calling 487-4389 and on the Library's web site, www.rgclibrary.org. Programs will run through July 9, 2010. The Rio Grande City Public Library is open Monday through Thursday 8:30 a.m. to 7:00 p.m., and Friday from 8:30 a.m. to 5:30 p.m.